Home→I think Elisabeth Warren is our best candidate for Vice President. Bernie and Warren would make a great ticket! Believe it or not, the 2020 presidential campaign is officially underway. Some candidates have already announced. Others are testing the waters. And a few are even hiring staffers and heading out to Iowa and New Hampshire as soon as this month. I don’t need to tell you how important the presidential race — and the Democratic primary to choose our nominee — will be in the year ahead. DFA members will work hard to make sure our candidates oppose Donald Trump and his GOP allies at every turn. But we’re not stopping there. We will also push our candidates to run on a progressive, multiracial, inclusive populist vision for America’s future. That means leading on issues from Medicare for All to voting rights, from criminal justice reform to higher wages and expanding Social Security, to enacting immigration policies that match our values rather than the kind of cruel nativism that results in the tear-gassing of refugee children at the U.S. border. Here’s the first step in this process: We need you to tell us where you stand right now, before the pundits, pollsters, and really even the candidates themselves have had a chance to weigh in. 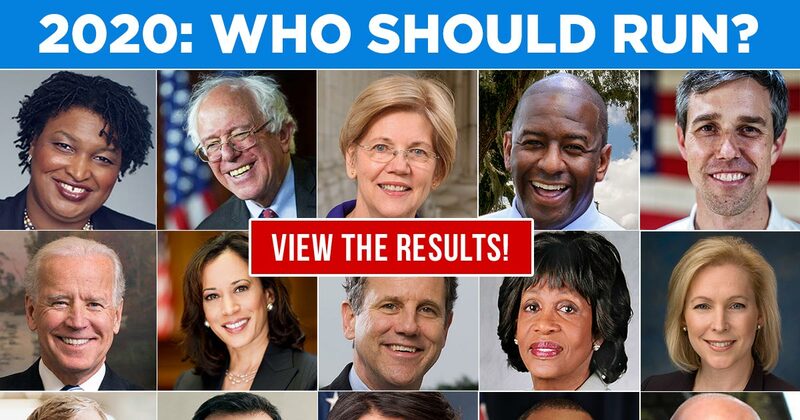 We want to know: who are the top three Democratic candidates YOU want to see run? Can you take a quick second to tell us which three Democratic candidates YOU think should run for president by answering our very first DFA Presidential Pulse Poll of 2020? We know that opinions change — and not all of the candidates listed here will even run. And if your preferred candidate is missing, you can write them in. But please do it today, because this primary is so important that we want to know where DFA members like you stand RIGHT NOW, before our grassroots team gears up for 2019 and 2020. We also know these results will be fascinating. Will Bernie Sanders and Elizabeth Warren duke it out for the top spot in this opening pulse poll? Will a rising star like Kamala Harris, Beto O’Rourke, Andrew Gillum or Stacey Abrams bolt into the lead? Is there a dark horse candidate not yet on the national radar already building support who will surprise the Democratic establishment and change the conversation forever? The truth is, we have a great opportunity to defeat Donald Trump if we nominate the right candidate — and there are so many possible choices! Your input today will give our team critical early insight as we develop our plans to make sure that a progressive who will fight for our values and defeat Trump wins the nomination. Fill out our super-short DFA Presidential Pulse poll and let us know who your three favorite candidates are today.